You just created your account, and now you’ve landed on the dashboard manager in the app. There are a lot of options and functionalities to discover, but how about you start by creating your very first dashboard? That’s why you’re here, isn’t it? So let’s dash your data! Before starting with the dashboard creator, make sure you’ve connected your data sources, so your report is full of meaningful numbers! You can learn here how to connect your data sources. Your data sources are already connected? Nice! 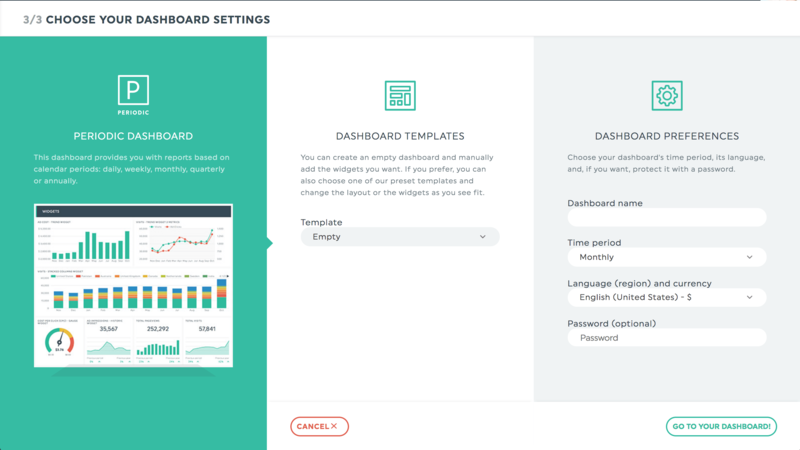 You’re ready to create your first dashboard! In the top-right corner of the screen, there is a button called New dashboard. Click it. The first step is to choose which type of dashboard you want. The periodic dashboard follows the standard calendar periods (daily, weekly, monthly, quarterly, and annually). It also allows you to browse through past periods. 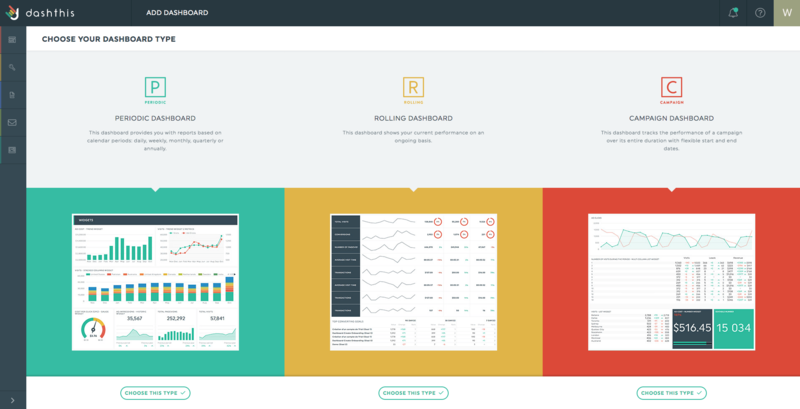 The rolling dashboard is designed to track your performance on an ongoing basis. This dashboard takes the present day as a starting point and displays data over a particular period of time (last 7, 15, and 30 days for example). The campaign dashboard shows the performance of an advertising campaign with flexible dates. If you want, you can also compare your current campaign to a previous one (of the same duration). Click on the dashboard you want to use. The next step is to connect your integration(s). Choose the integration you want to use in your dashboard, then the account, and then the data source. The integrations and accounts displayed here will only be those that you’ve already connected to DashThis. If you want to connect more, follow these easy steps! But how about adding more data sources to your dashboards? Once you’ve added your first data source, have a look at the upper-left side of the screen. Click “Integrations” if you want to add a new integration. You can also click “Accounts” if you want to add another account from the same integration. Repeat this easy step for as many data source as you want! Once you’ve added your data sources, you can set your dashboard preferences! If you want, you can choose one of our preset templates designed by our experts. You can also start your dashboard from scratch and choose an empty template, your choice! The last step is where you choose your dashboard’s name, time period, language, and currency. The time period is the length of time shown in your dashboard. Depending on the type of dashboard you’ve chosen, your time period options will be different. You can then choose the language according to your selected region. Please note the language you choose won’t apply to the entire dashboard. In the Editor mode, the Previous period and the Previous year buttons in each widget, as well as the menu in the top right corner of the widgets, will be in the language you’ve selected. The titles of the dashboard, widgets, and headers automatically appear in English, but these fields are fully editable. Just click on the field you want to change and write the title you need. In the Viewer, the periods will appear in the language you’ve selected and following the format of the region. If you want to have a complete translation, contact us! The currency will be determined depending on the language and region you’ve chosen. You can also include a password in order to protect your dashboard. Now, it’s time to dash your data! Click Dash This! If you’ve chosen a preset template, your dashboard will appear. If you’ve chosen an empty dashboard, your next step is to add your first widget! Go back to your account, and create your first dashboard!